~ Welcome to Heavenly Cottage by the Sea! Distant Ocean View from Updated Cottage. ~ Welcome to Heavenly Cottage by the Sea! 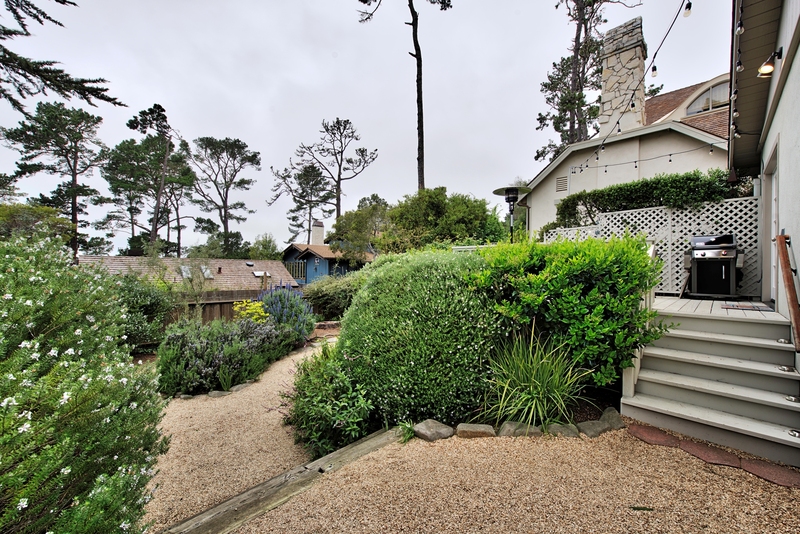 Distant Ocean View from Updated Cottage, ~ Living Room with Fireplace and Queen Sleeper Sofa. ~ Comfortable Living Room with Vaulted Beamed Ceilings. ~ Living Room with Dining Area. ~ Beautiful New Chef's Kitchen. ~ New Fully Equipped Kitchen. ~ Chef's Gourmet Stainless Steel Appliances. ~ Wine and Cheese to Welcome You! ~ Distant Ocean View from the Deck off the Kitchen. ~ Gas Grill and Fire Pit on the Deck. ~ The Deck is a Wonderful Place to Hang-Out! ~ Master Bedroom with Plush Bed and luxurious Bedding. ~ Master Bedroom can be Set-up as a King or Two Twins. ~ New Custom Tiled Bathroom. ~ Guest Bedroom has a Plush Queen Bed with Luxurious Linens. ~ Guest Bedroom with Queen Bed. 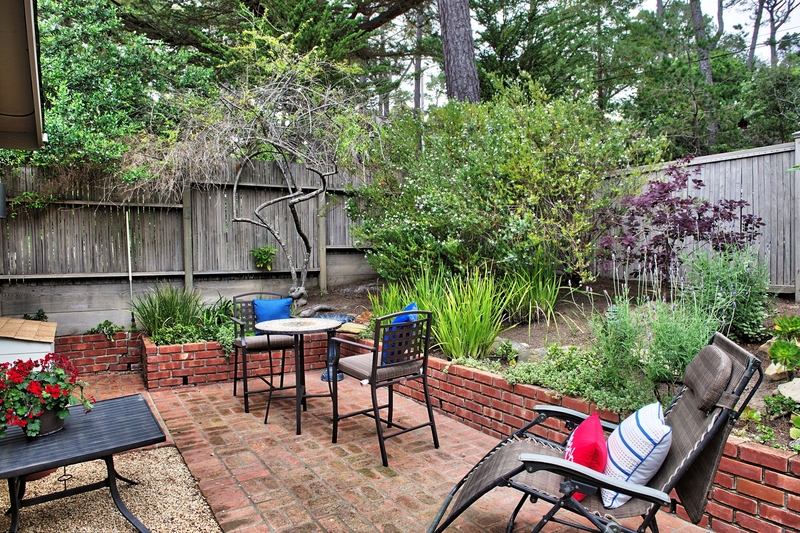 ~ Front Courtyard Patio surrounded by Fruit Trees and Flowers. ~ Front Courtyard Patio surrounded by Fruit Trees and Flowers. ~ Lovely Landscaping with Fruit Trees and Flowers. ~ Fully Fenced Yard. ~ ~ Carmel Mission ~ The beautiful rocky coastline for which the Monterey Peninsula is is famous. ~ Another stunning sunset along the rocky coastline. 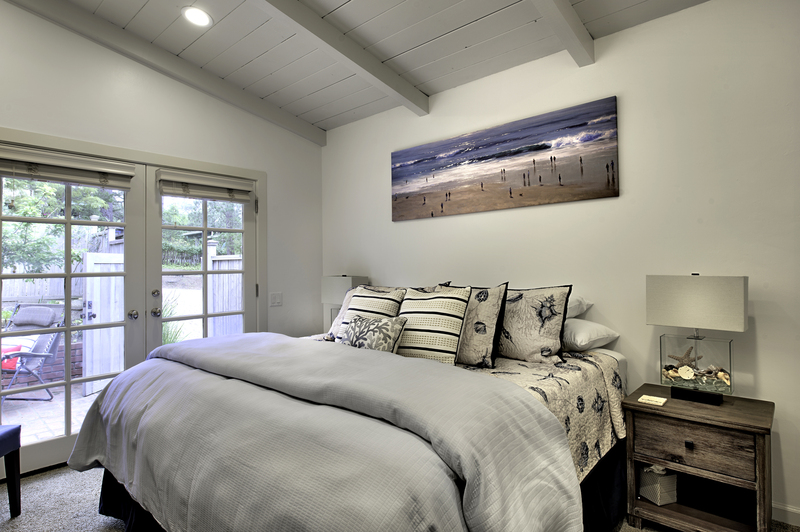 Welcome to Heavenly Cottage by the Sea. Cottage sleeps up to 4 adults and 1 child age 12 or under. 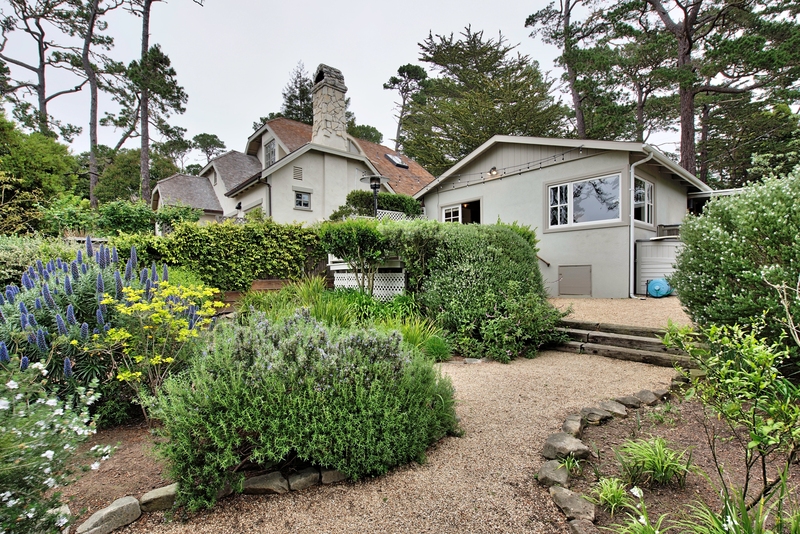 Peace and quiet can be found in abundance at this charming cottage, which offers privacy in a beautiful setting that’s also close to the beach as well as shopping and dining in Carmel-by-the-Sea. This 850sf, 2-bedroom, 1-bath residence, completely updated yet with unique artistic touches throughout, provides modern conveniences along with a sense of history in a lovely tree-lined neighborhood away from tourist traffic. 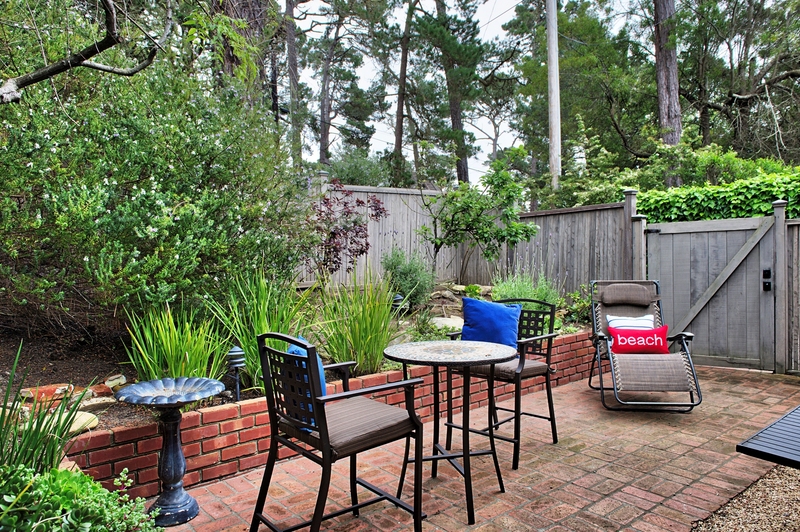 A front courtyard patio and a fenced back yard give the opportunity for relaxation, with comfortable outdoor sitting areas surrounded by fruit trees and flowers. 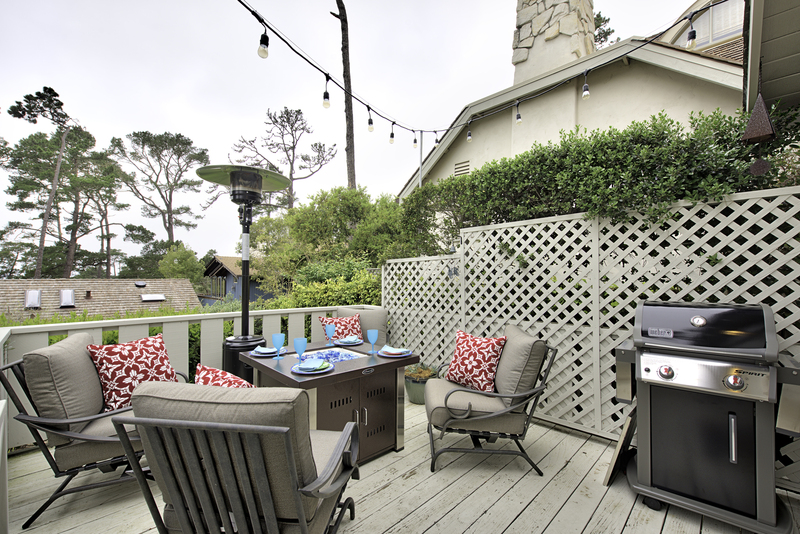 Cookouts are a breeze with the help of a gourmet gas grill on the back west side deck with distant ocean views, and the fully fenced patios offer security for four-legged companions at this dog-friendly residence. A fire pit table and seating for four is available on the deck as well. 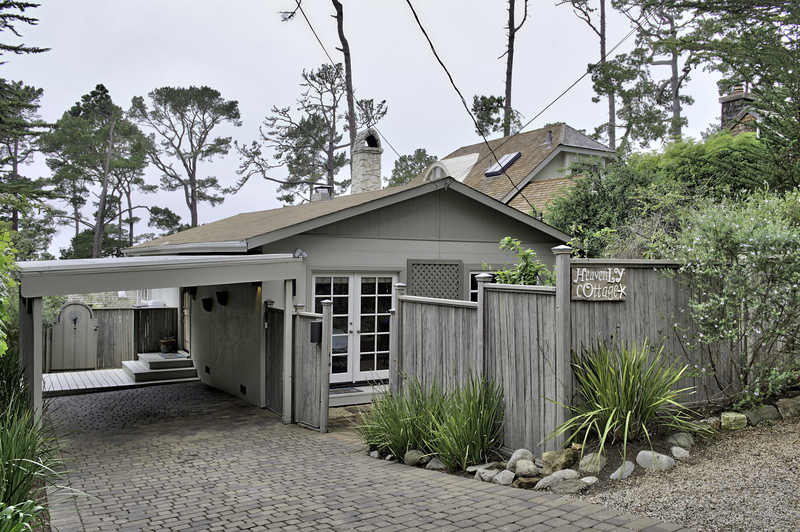 In addition to being within a 10 minutes’ walk of downtown Carmel-by-the-Sea and 15 minutes to the beach, the house is just a half hour by car from the natural beauty of Big Sur, 10-15 minutes by car from the world-class golf courses and restaurants of Pebble Beach and the Monterey Bay Aquarium and Cannery Row. 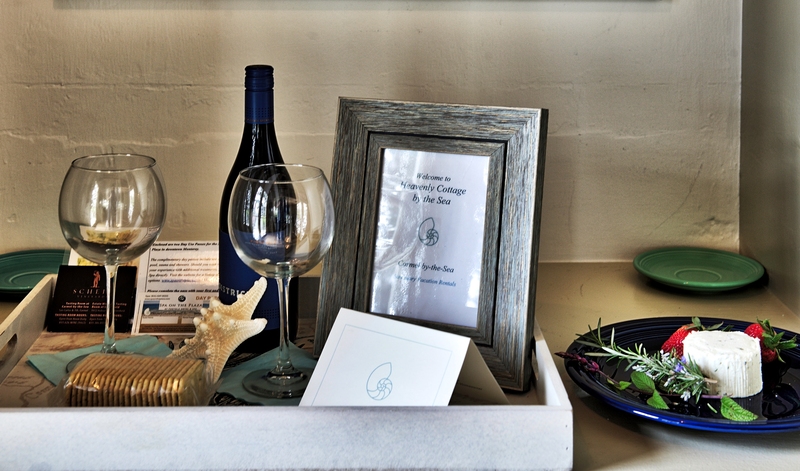 Upon your arrival you will be greeted with complimentary wine and cheese, tickets for a wine tasting at Scheid Vineyards’ tasting room in downtown Carmel-by-the-Sea and a basket of local information. An assigned concierge vacation house manager is available to assist you during your stay. We have also provided spa amenities in the bathrooms, spa robes and beach gear. The sophisticated interiors incorporate seashore style along with carefully chosen vintage furnishings, such as the shabby chic dining room table that seats up to five. Large windows let in ample light, and wood floors can be found in the kitchen, dining room and living room. Leather sofas surround a gas-burning fireplace, making it a cozy place to gather on cool evenings, a perfect place to enjoy conversation or play games. 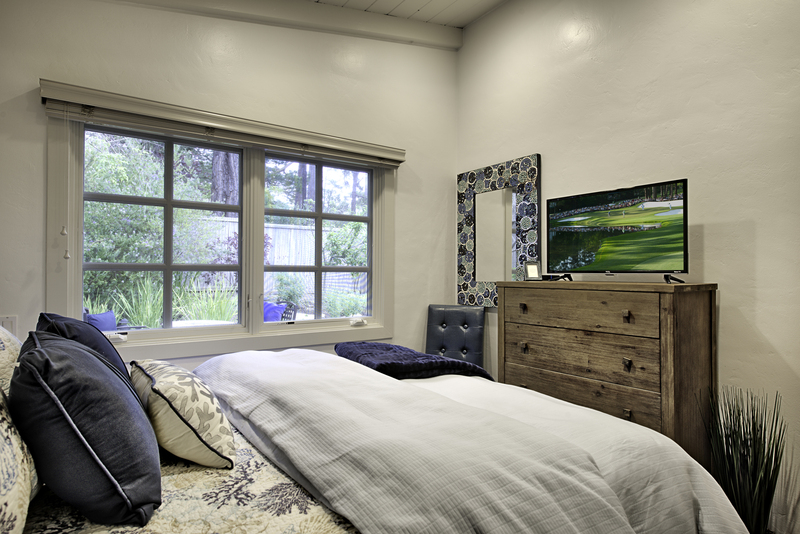 A 50-inch HDTV can be viewed either from the living room or kitchen. Tumbled limestone tile and new stainless steel appliances lend flair to the kitchen, including a four-burner chef-quality Thermador range and a Sub-Zero refrigerator. A large sink and pull-down faucet makes cleanup quick and easy. 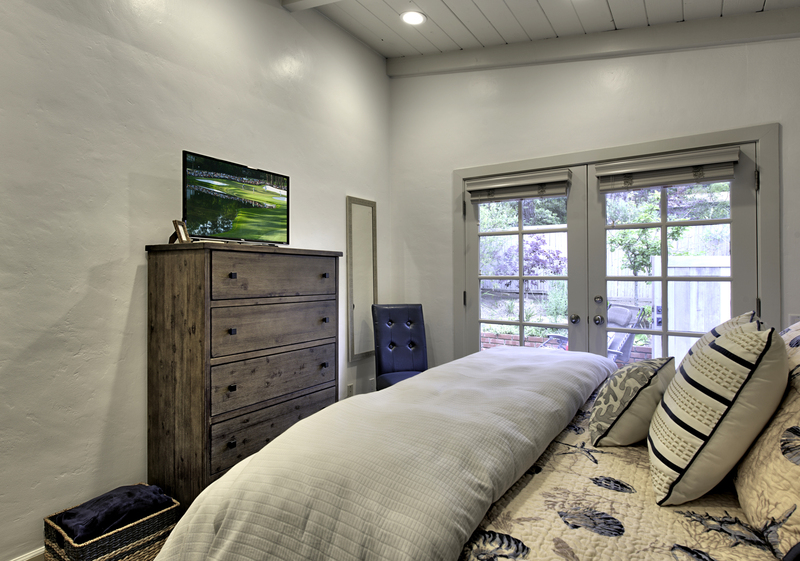 The master bedroom includes a king bed with memory foam topper that can become two twins and a 36-inch HDTV as well as French doors that open onto the front patio. 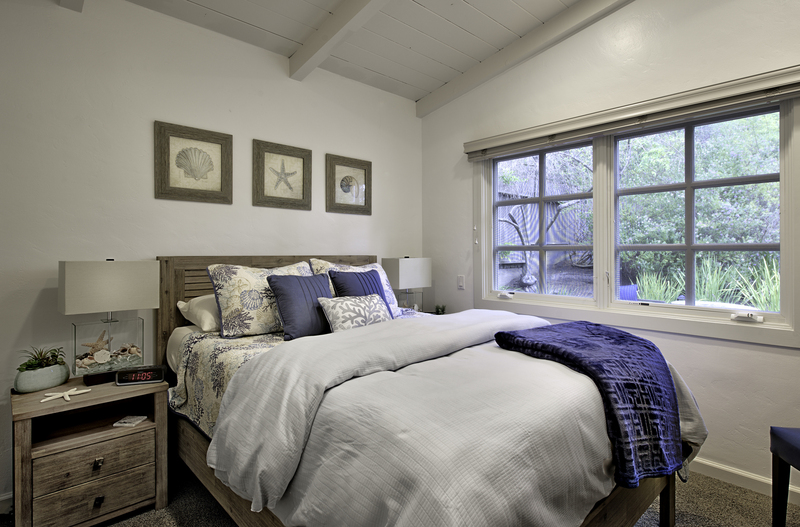 The second bedroom has a queen bed and HDTV as well as windows that offer views of the front patio, which includes a birdbath and flowering trees, a peaceful place to pause and reflect. A queen sleeper sofa is available in the living room that may provide a sleeping option for a child. 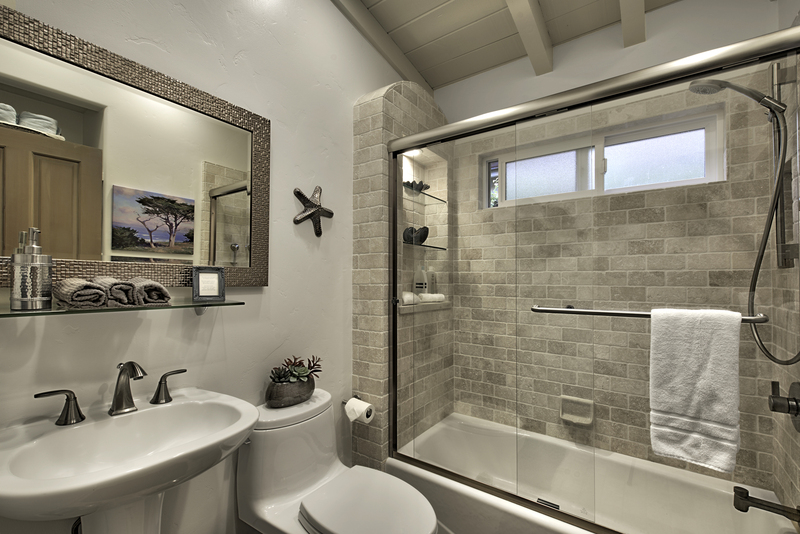 The bathroom features custom tile work in the combination tub/shower in addition to a pedestal sink. There is a stacking washer and dryer in a closet in the hallway. Parking and storage for beach gear is available in a carport next to the house. See also Rates Notes for additional information about this property. **Last Minute Specials typically exclude holidays, special events and the summer season; specials cannot be combined; other exclusions may apply. Please call for details. ** Holidays & Special Events may have higher rates. ** Housekeeping, Processing and Property Protection fees and taxes are additional to the base rates. ** Guest stays of 30 days or more will also be responsible for utility charges (Electricity, Gas and Water), mid stay cleaning fees and a security deposit. ** Rates are subject to change and Owner approval. 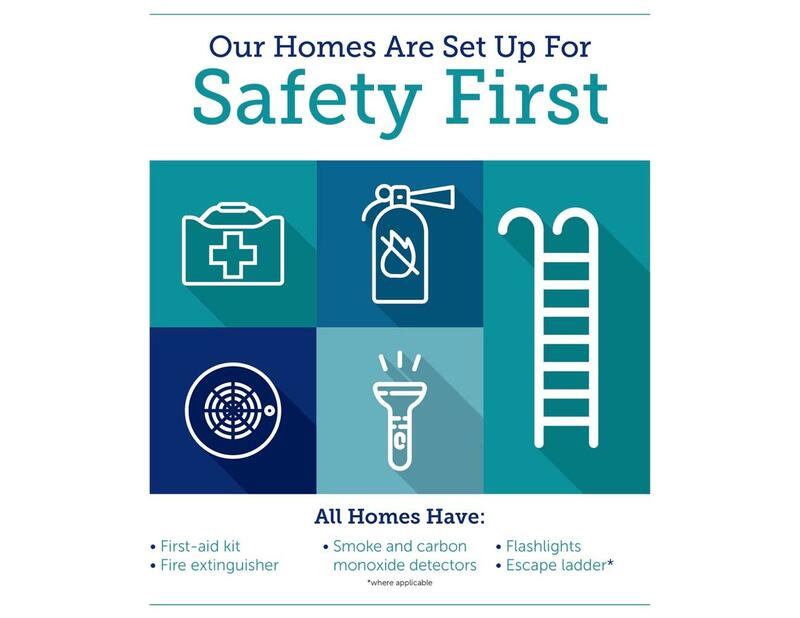 ** Total occupancy may affect rates: Rates may vary depending upon how many guests are occupying the home, including all infants and children. ** This home is managed by Sanctuary Vacation Rentals. "Had a fun month!! Close to beach and town. Well appointed. Comfortable." "Cute cottage! Lovely peek views of the ocean from the back yard deck. We enjoyed the deck firepit and family room fireplace on most foggy nights. Very Carmel! The house was on a quiet street. We were able to walk to town for lunches and dinners very easily. Our doggies were able to stay with us which is a huge plus! Very clean place with all emenities we needed :) Only one bathroom takes a bit of coordinating for showers, etc. The driveway accommodated our two cars easily. We would stay here again!" Maximum occupancy - Home sleeps up to 4 adults and 1 child age 12 or under.